Shamwari is about conserving a vanishing way of life and is the realisation of one man's dream, and the success of many people's passion. The Shamwari Game Reserve spreads over an area of 25 000 hectares of malaria-free land. This private game reserve is situated in the Eastern Cape of South Africa and has received numerous international awards, including the World's Leading Conservation Company and Game Reserve for many consecutive years. 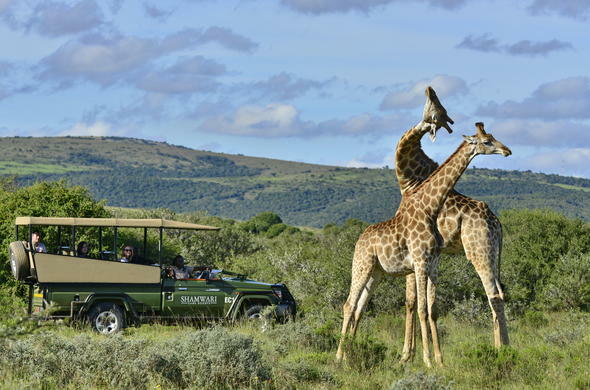 Shamwari Game Reserve is situated in verdant bush along the Bushmans River, halfway between Port Elizabeth (45 minutes drive outside the city) and Grahamstown, a pleasant drive from Cape Town, forming a natural extension to the famous Garden Route. Steeped in Settler history, and dating back to the time when a multitude of game roamed wild and free, the 25 000 hectare reserve boasts 5 eco-systems, thus enabling the support of many forms of plant, animal and bird life. This Eastern Cape game reserve is the ultimate African adventure and conservation effort coupled with responsible tourism. Children under the age of 12 years are accommodated at selected lodges only. For example, Long Lee Manor is a family-friendly lodge where children under the age of 12 are welcome. Children’s Game Drives are on offer (no children under the age of 7 years can go on an adult game drive). Various kids activities are available as well as menus for the youngsters. Parents can make use of the babysitting services. Long Lee Manor in Shamwari Game Reserve also has a family suite and 4 interleading rooms, the perfect accommodation for families.